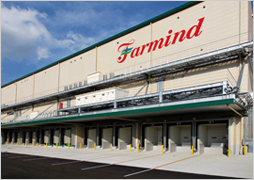 Farmind has constructed a cold chain to handle transport of fresh produce at optimal low-temperatures throughout the supply chain, from the production site to the retail store, and maintain its freshness. Fresh fruits and vegetables pass through various distribution channels during their journey from the grower to the consumer. Cold chain distribution enables delivery of high-quality products with their “field freshness” maintained. Our strategically located distribution centers are key facilities in our cold chain logistics. Products are managed at the proper temperature from their arrival at the center to their shipping out to market with no compromise in their freshness. Pre-inspection based on complex standards (growing site, grade, quantity received, size, packing style, etc.) characteristic of agricultural products, as well as on evenness of quality, helps to reduce in-store losses and complaints from store management. We conduct inventory management, including storage of products arriving on days just before market holidays as well as of specialty products and processed products received directly from the farmer, in storerooms with temperatures adjustable to multiple settings. Our online systems expedite sorting operations to facilitate accurate sorting at low cost. Equipped to keep outside air from entering, our facilities prevent quality deterioration and design optimum delivery routes. 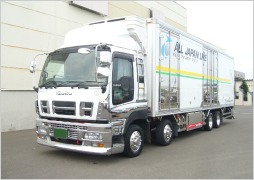 Refrigerated trucks are the mainstay of climate-controlled distribution.